The world organization Amnesty International, present in more than 150 countries, demanded that the national authorities of Bolivia, and in particular the government minister, Carlos Romero, stop persecuting and arbitrarily expelling Venezuelan migrants in vulnerable situations. 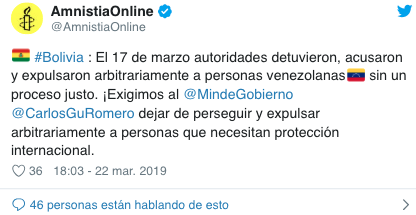 The director for Las Americas of Amnesty International, Erika Guevara Rosas, directed a tweet to the Ministry of Government and Carlos Romero to ask him to stop the persecution of Venezuelan people. “Minister Carlos Romero, stop arbitrarily expelling Venezuelan people, they need protection, not persecution!” Wrote Guevara in her message. On March 17, police and immigration officials detained 14 Venezuelan refugees (three women and 11 men) in a shelter in La Paz, Bolivia, who had participated in a peaceful demonstration against human rights violations in Venezuela on March 15. The officers took them to the immigration office and accused them of “conspiracy” and “political activities in exchange for money,” violating their right to due process. That same day, six of them were arbitrarily deported. The remaining eight, who had requested asylum, were released, but five subsequently fled to Peru for fear of further persecution. 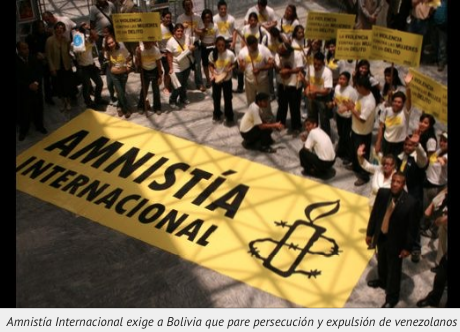 The released who remain in Bolivia fear more persecution and arbitrary deportation, says Amnesty. According to local organizations and witnesses, many of the detained migrants were mistreated and threatened by police officers, even targeted with a firearm. 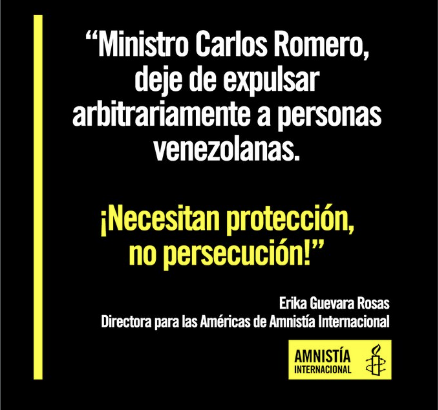 In view of this situation, Amnesty International activated the Urgent Action to urge the Minister of Government to stop the persecution and the arbitrary deportation of Venezuelan refugees. “All persons, including irregular migrants, regular migrants, asylum-seekers and refugees, have the rights to freedom of expression, peaceful assembly, due process and judicial guarantees, and not to be subjected to ill-treatment or collective expulsion,” says Amnesty. This entry was posted in Bolivia, Politics, Social Unrest and tagged corruption in public office, demagogue, freedom of expression, government failures, human rights, police aggression. Bookmark the permalink.